SAO is responsible for the preparation of the Kepler Input Catalog, which will be used by the mission to select optimum targets. SAO will also be involved in follow-up observations of interesting candidates identified by Kepler. The goal of this web site is to document our activities for the Kepler Science Team and for other users of the Kepler Input Catalog and data from the mission. Send comments to dlatham [at] cfa.harvard.edu. 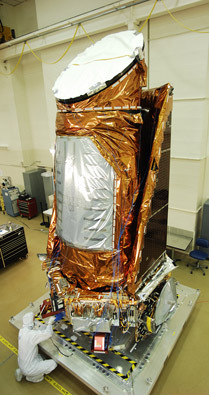 Build 10 of the Kepler Input Catalog (KIC) was delivered to the Kepler Mission on 12 August 2008. Access to that version of the KIC will be granted to users with a legitimate need. Contact Dave Latham for more information. Previous builds of the KIC may be floating around, but they all have serious deficiencies. Copies of the papers may be found here. Kepler FOV Calculator - to determine if an R.A. and Dec falls on a CCD module. Download a PDF version of the following image.